The Catskill Mountainkeeper is running a slick con game, promoting fractivism with a “family-friendly” Taste of the Catskills event that is anything but. The Catskill Mountainkeeper holds an annual Taste of the Catskills Festival – its “biggest fundraiser of the year” – to raise money to fight fracking. They con a lot of other people into the cause or listening to them by presenting the event as a family-friendly farm and food celebration but it’s anything but that. It’s more like a gathering of the forces that want to take over my county and prevent me from making a decent living. I took my family to this year’s Taste of the Catskills Festival in Delhi, Delaware County, NY (I live at the western end of the county in Deposit and Delhi is our county seat). 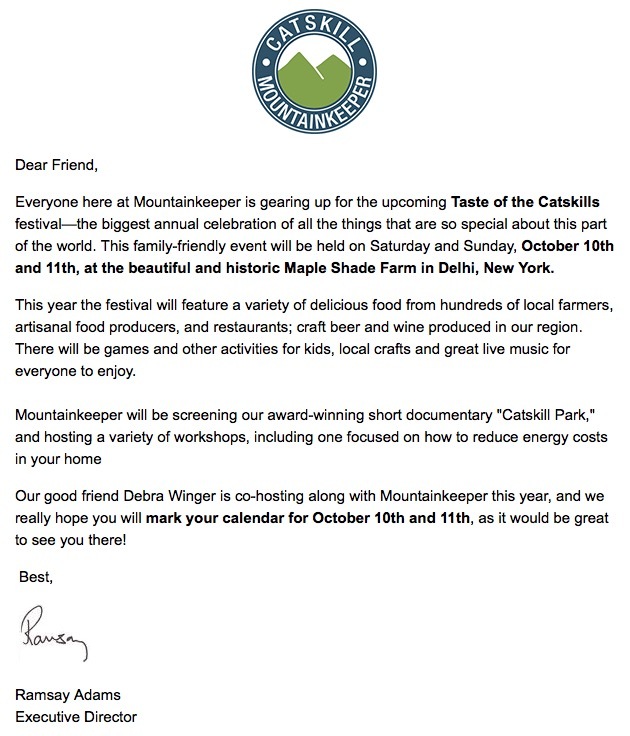 The event was promoted by the Catskill Mountainkeeper, the “presenting sponsor” as a “family-friendly event” with this invitation, which also promised Debra Winger (who I later learned was the producer of Gasland) would be there (she wasn’t). It was quite an eye opening experience. They charged $10 per adult and $5 per child. After coughing up $35 to get us all in, you would think the children’s activities would have been free. But, much to our surprise, the $35 only covered mingling with a bunch of wealthy move-ins who think they are saving the environment by organic farming and denying the rest of us jobs. For another $30, my children could go in the bounce houses and that was just the beginning of a list of activities for which we had to pay so the Catskill Mountainkeeper could raise more money to fight against our interests and keep fracking as far away from the Rockefeller lands in the Beaverkill area as possible. The one thing that was free was their frequently offered opposition opinions on natural gas development even though I would have paid them to shut up! For aging hippies and other trendies opposed to fossil fuels they sure do love to cook with propane made from natural gas, though, as it was the only source of energy used to cook their food. No campfire charred hot dogs or solar powered grills; nope ,they made every morsel with propane. I hope all of these tree hugging, sun worshiping, fear mongers realized this was a contradiction of everything they professed. And, I did not see a single bicycle in the parking lot, and even though the event was along a stream, no canoes. Perhaps they car pooled on their way up from New York City, though. The entertainment was great though. I got a really good laugh over Susie Essman. This so called comedian from New York City provided some un-family-friendly remarks that were supposed to be funny, I guess, but where things got hysterical was when she had admitted (at about 2:00) that she had never before stepped of the city to come to upstate and then preached at all us upstaters about what we needed to do to keep it beautiful for her enjoyment. She had no clue as to what fracking was and, as the audience chuckled, she said it just sounded bad to her so let’s just not do it and keep upstate beautiful. What a message! Next up was Phil Giltner, NYS Deputy Commissioner of Agriculture and Markets (at about 0:50). I had a chance to speak with him after his speech about how the governor is so happy to be working closely with the Catskill Mountainkeeper (which is hardly a surprise, as we’ve had two DEC commissioners in a row with close connections to the NRDC from which the Mountainkeeper was indirectly spun off. Giltner informed me that there were jobs coming to the Southern Tier, although he could not tell exactly where or how many jobs. He also informed me that the governor is aware of the job decline in the area and he will, just maybe, just possibly, be doing something to help us. It saddens me to say I initially bought into the hype of Taste of the Catskills. It appeared to be a great down home event that I thought my family would enjoy. But, instead, it had a hidden agenda. Not only did a drop $100 on a horrible misleading event, but we missed our home town festival (with free entertainment for the kids might I add) for this agenda driven group of hypocrites. You summed it but well Sandra! I would add no one should be surprised by what the creeper will do for their uninformed agenda!